Mt Elgon area is home of mainly two tribes, i.e the Bagisu and the Sabiny, with the marginalized Ndorobos who were forced to live deep within the seek forest of Benet. These tribes living with in the protected area have interesting traditional cultural and historical back ground which is attached to the mountain. 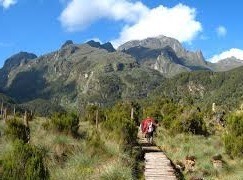 For instance the Bagisu tribe famously known as the BaMasaba takes Mount Elgon to be the manifestation of their first father Masaba and hence they call the mountain by this name. Therefore travelers on their Uganda safaris who spend time to travel to mountain Elgon are rewarded with wonderful cultural encounters. The interesting cultural encounter in mountain Elgon national park is experienced when a visitor is taken to meet the Sipi Widows’ Group-Here one can view the mountain sambas which are an area of cultivated ground full of Arabica coffee and also meet the Bagishu farmers. The Sipi Widows’ Group will take the visitor on a guided walk through the beautiful coffee plantations and the guide will demonstrate the different activities involved in coffee growing such as planting as well as picking, grinding, washing and storing the coffee. Tourists on Uganda safaris mainly touring mountain Elgon will also learn about life of the local Sabiny as one can meet local residents, and participate in different traditional weaving. Learn about interesting African cuisine through cooking, as well as tasting of local Ugandan dishes. Taking a visit to the local women’s handcraft shop located in the nearby trading Center, where visitors can buy the art and craft made by the local women. From the trading center, visitors are requested to Proceed to other places where coffee trees are maintained, get involved in educative activities such as raising awareness about the negative effects of female circumcision which is the traditional practice done the sabiny local people. Participating in Budadiri Community Walks enables tourists spending their safaris in Uganda to have Ecotourism Experiences. This community group is situated in Budadiri and it offers accommodation where tourist can spend a night. The community ground also organizes cultural dances and provides guided coffee tours and community nature walks. There is also a trip to Mt Elgon’s popular industry which processes Arabica coffee, which supports local farmers.